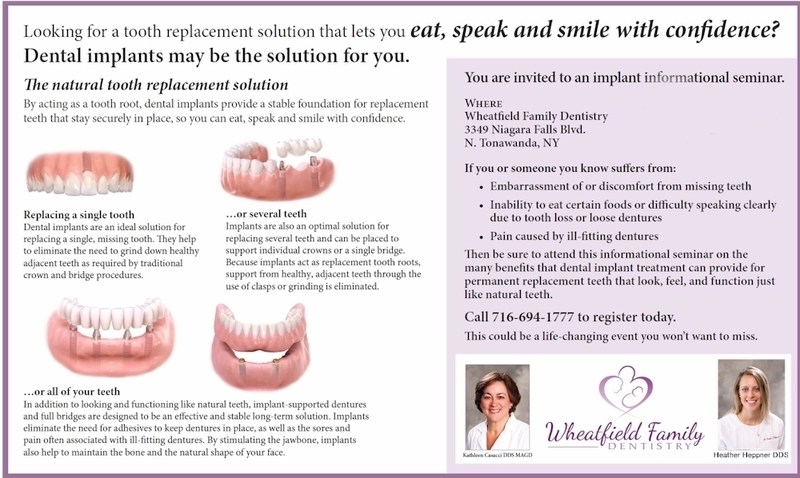 If you are looking for a permanent solution for missing teeth, dentures that don’t fit, or fear has kept you from getting to the dentist and having that smile you always wanted, come to our free seminar on implant dentistry…and please feel free to bring friends/relatives. Our dentists will give a 45-minute presentation explaining how dental implants can improve your life, answer questions, and give new patients a tour of the office. Attendees will be eligible to receive free x-rays and an evaluation. Refreshments will be served. Please call 694-1777 to reserve your spot! Copyrights © 2015-2016 - All Rights Reserved - Wheatfield Family Dentistry.